Picture your daughter on a date and suddenly it goes terribly wrong, and now she’s trapped inside his car or dorm room. What next? 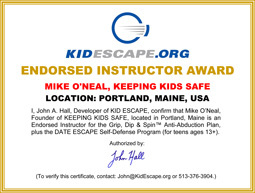 Mike O’Neal, founder of Keeping Kids Safe, is one of only a few certified instructors of the Date Escape method. This program is for adults and teens 13 and up. Contact Mike O’Neal today for a live demonstration at your organization or business. View the video clip below for a brief demonstration of the Date Escape method.